Last week I decided to start sharing my weekly menu plan. Today, I wanted to share the 'HOW' when it comes to menu planning. 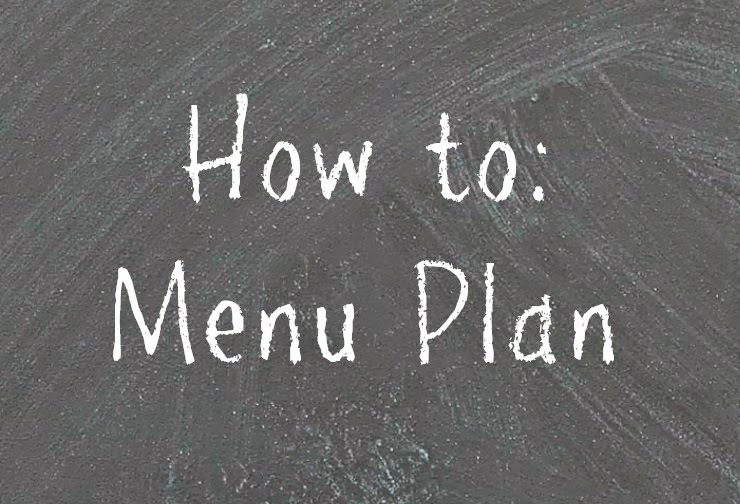 When starting to menu plan, it can be overwhelming, like most new things. Until just a few years ago, I never planned out our meals. I would just use whatever we had in the house to make each meal. We bought the same basic things from the grocery store and I just built my recipes off of that. I found myself constantly running to the store to pick things up, or asking hubby to pick something up on his way home from work. It just wasn't working. We were spending more money than I had planned for groceries and it was stressful! Nothing like getting into a recipe only to find it needs to sit overnight. That's totally NOT awesome! The very first thing I do when planning out my menu is to print out these Printable Weekly Menu Planners from Kristy at Mommy Hates Cooking. When I first started, I just used notebook paper. However, I love these printables! As I am making my menu and reading the recipes, I can just write my grocery list right on the planner! I love this option as I can take the entire planner to the store with me and when I second guess myself on an ingredient, I just run through my menu real quick to make sure I actually need that bunch of basil. The next thing I do is search my favorite menu planning websites. I start with Kristy's site, since I am already there printing the planner anyway. ;-) Next, I head to Once a Month Mom and check out her various monthly freezer food menus (I will get to freezer cooking in a few weeks). After OAMM, I head to eMeals. They are actually running a Back To School Special right now! Check out this Back to School PDF for free! If you like it, be sure to sign up for any of their meal plans using code SCHOOL15 for 15% off! If I am still needing a few other ideas, I hit Pinterest. We had gotten into a bad kick of eating chicken for almost EVERY meal. I do love chicken but, that gets old. FAST! I currently keep 1-2 "regular" meals on our menu each week but, for the most part, we try new things every day. There are as many ways to menu plan as there are to cook chicken! HA! The key is finding what works best for you. I hope to eventually start doing monthly menu plans, but for now I will stick to weekly. I think it is important to check out various sites when building your menu. There are SO many great recipes out there! What are some of your favorite sites to check out for menu planning?